Call Boat owner Ken 417-876-7072. Ski boat / Bass boat. 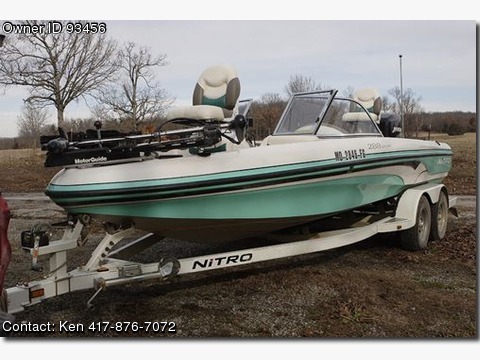 Boat is a 2005 model 20'2" Nitro 288SP Fish N Ski. This boat is in mint condition. Blue Book retail from a dealer – $20, 775. Filter added in gas line to trap water. I use less than one tank of gas a season. It has been given baby care. been fogged by a professional boat mechanic. Top speed with the prop is about 50 mph. motor), second kills power to everything except main motor. time) Detaches and fits in front storage for ski boat mode. Spare tire — never used. Detachable Bimini top (used once or twice). Aluminum plugs for boat seat mounting holes (custom made). Two chairs for bass fishing. 2 seat extension poles for bass fishing. rectangle just to left of Tom Cat tube). Rod storage on both sides. Ski storage in floor of boat. Cooler under middle back seat. electric brakes from locking up when backing).